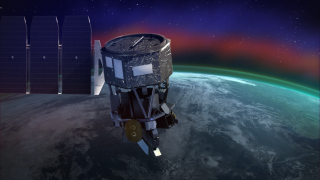 The launch of NASA's much-delayed mission to study the interaction of terrestrial and space weather has again been postponed, the agency announced today (Oct. 23). The mission, an Earth-orbiting satellite known as Ionospheric Connection Explorer, was originally scheduled to launch in December 2017 and has been repeatedly delayed because of problems with its rocket. Most recently, it was due to launch early in the morning of Oct. 26 from a carrier airplane that would take off from Cape Canaveral Air Force Station in Florida. NASA has not offered a detailed reason for the new delay beyond that the team wanted to continue testing the rocket. "NASA and Northrop Grumman have delayed the launch of the agency’s Ionospheric Connection Explorer, or ICON, to conduct further pre-launch testing on the rocket," NASA officials said in a statement. "Upon completion of the testing, a new launch date will be established." The agency has not yet rescheduled the launch and did not express any sense of how long the delay would last, although its statement did specify that the spacecraft itself "remains in good health." ICON's rocket, a Pegasus XL booster built by Northrop Grumman Innovations System (formerly Orbital ATK), is unusual — rather than launch from the ground, the rocket and spacecraft are carried aboard a plane and dropped midflight, at which point the rocket fires. In June, that complete package took off for the Marshall Islands, which was then the mission's launch site, only to turn back on account of a problem with the rocket. The ICON mission is designed to study the ionosphere, a layer of Earth's atmosphere where terrestrial and space weather interact. It's a tumultuous part of space, but it's also a crucially important region for GPS satellites and other infrastructure in space, hence NASA's decision to build the grounded spacecraft.